Jennifer is an award-winning designer and an excellent writer. She has been in the web and design trenches since 1997, working with corporations, casinos, professional sports teams, magazines, creative agencies, political campaigns, small businesses, and entrepreneurs alike. Today she runs Bourn Creative where she consults on brand, website, and digital strategy. 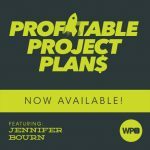 In this session she is going to share with us the strategies she’s leveraged to make her projects and business more profitable while making her clients happier and more informed.